For those who didn’t know I live in Canada and the rumours are true that in the winter it can get cold, scary cold. We’ve had quite a cold snap the last week with -30°C (-22°F) temperatures and that’s not including the wind chill factor which can make it like -40°C (-40°F). So working on a Spring themed pattern seems ironic to me. The design for this pattern has been a struggle, it’s been a lot like when you have a great drawing idea in your head and you just can’t get it onto paper. The bee motif was exactly like this and although I’m happy with it the one in my head is still better. 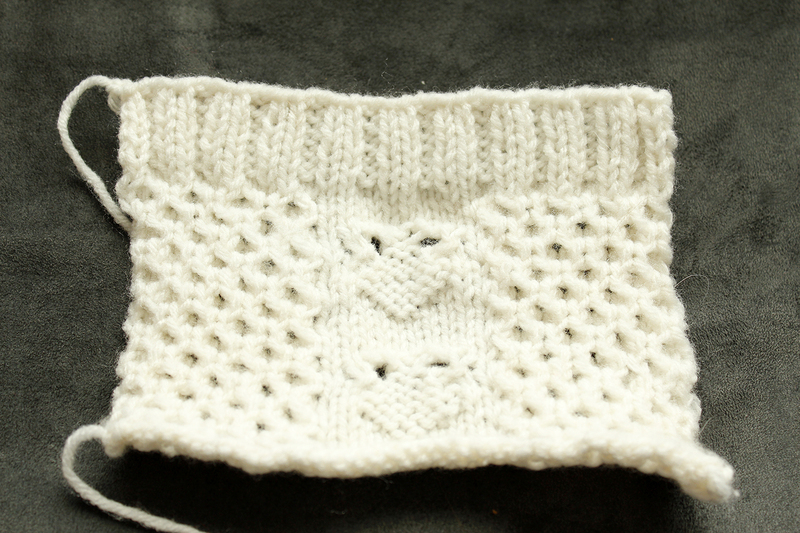 I knit many, many combinations for the bee trying to get the wings to show up without looking like huge holes. The second issue is the yarn in the image isn’t yarn I intended for this pattern. The yarn I have is a dark gray that is too dark to really show off the design. I’m in the process of knitting it in the gray anyway. Part of it is the wish that somehow the gray will still work, it’s part denial that it won’t work and to at least see how the weight of the yarn works for the pattern. Once I get past my denial stage I’m going to have to purchase the yarn in an off white or something light. I still haven’t revealed what I’m making – I’ll tell you later.